SCENE: Police cordon off Market Square Shopping Centre after the stabbing. A “young male” is fighting for life after a stabbing in central Geelong today. 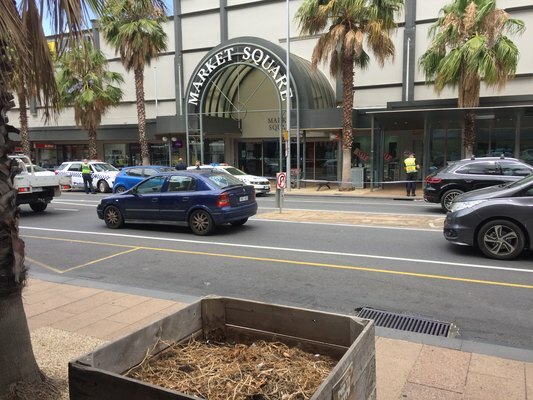 A witness described seeing people “feverishly” performing CPR on the victim in Market Square Shopping Centre before ending their apparent effort to revive him. Paramedics then ferried him to University Hospital Geelong. Barwon Health told the Indy the man was in a critical condition but was unable to provide further details. Witnesses described him as a “young male”. The Indy believes the male was stabbed in Moorabool St near a bus stop outside the shopping centre during an attempted robbery. The victim apparently then entered the centre bleeding heavily before collapsing. Numerous officers and police vehicles rushed to the scene, arriving around mid-afternoon. Police have cordoned off an area around Moorabool St side of the shopping centre as investigations continue.